1Universidad Autónoma Metropolitana, Unidad Iztapalapa, Departamento de Hidrobiología, Laboratorio de Fitoplancton Marino y Salobre, Av. San Rafael Atlixco 186, Col. Vicentina, Iztapalapa, 09340 Cd. Mx., México. Harmful algal blooms (HABs) affect the marine ecosystem in multiple ways. The objective was to document the species that produced blooms in Acapulco Bay over a 15-year period (2000-2015) and analyze the presence of these events with El Niño-Southern Oscillation (ENSO). Thirty-five collections, made during the years 2000, 2002-2004, 2006-2011, 2013-2015, were undertaken with phytoplankton nets and Van Dorn bottle, yielding 526 samples, of which 423 were quantified using the Utermöhl method. The relationship of HAB with ENSO was made with standardized values of Multivariate ENSO Index (MEI) and the significance was evaluated with the method quadrant sums of Olmstead-Tukey. Using data of cell density and high relative abundance (>60%), 53 blooms were recorded, most of them occurring during the rainy season (June-October) and dry-cold season (November-March), plus 37 blooms reported by other authors. These 90 blooms were composed of 40 taxa: 21 diatoms and 19 dinoflagellates, the former mostly innocuous. Sixty-seven blooms had species reported as noxious, of which 11 species commonly produce toxic HAB. Toxic taxa are Pseudo-nitzschia spp. (four taxa), and seven dinoflagellates. Abundance analyses of Pyrodinium bahamense var. compressum and Gymnodinium catenatum against values of MEI showed a clear tendency to produce HAB in La Niña conditions. Both taxa, producers of saxitoxins, cause paralytic shellfish poisoning (PSP) and coexist in Acapulco; therefore, they present a risk to human health. Another noxious 52 taxa found in Acapulco were currently considered potential HABs, because they have been recorded at low densities. Given the sharp differences in density values of bloom-forming species found in this work compared to those reported by other authors on similar dates, it is important to perform calibration tests to rule out possible errors in cell counts. Los florecimientos algales nocivos (FAN) afectan al ecosistema marino de varias maneras. El objetivo fue reconocer las especies productoras de dichos florecimientos en la Bahía de Acapulco, durante un periodo de 15 años (2000-2015) y relacionar su presencia con el fenómeno El Niño-Oscilación del Sur (ENSO). Analizamos 526 muestras de 35 colectas efectuadas durante los años 2000, 2002-2004, 2006-2011 y 2013-2015, realizadas con red y botella Van Dorn; éstas últimas (423) cuantificadas con el método de Utermöhl. La relación de FAN con ENSO se hizo con valores estandarizados del Índice Multivariado ENSO (MEI), y las significancia evaluada con el método de Asociación de Cuadrantes de Olmstead-Tukey. Con base en la densidad celular y abundancia relativa alta (>60%) se reconocieron 53 florecimientos, la mayoría durante la época de lluvias (junio-octubre) y secas-fría (noviembre-marzo), más otros 37 eventos reportados por distintos autores. Estos 90 eventos estuvieron conformados por 40 taxa (21 diatomeas y 19 dinoflagelados); los de diatomeas, en su mayoría, inocuos. Sesenta y siete florecimientos estuvieron conformados por especies reportadas como dañinas, de las cuales 11 comúnmente producen FAN tóxicos. Los taxa tóxicos fueron Pseudo-nitzschia spp. (cuatro taxa) y siete dinoflagelados. Los análisis de abundancia de Pyrodinium bahamense var. compressum y Gymnodinium catenatum, en relación con los valores MEI, mostraron una clara tendencia a producir FAN en condiciones La Niña. Ambos taxa, productores de saxitoxinas y causantes de envenenamiento paralítico por moluscos, incluso llegan a coexistir en Acapulco, representando un riesgo para la salud humana. Otros 52 taxa dañinos por encontrarse en bajas densidades, se consideraron por el momento potenciales formadores de FAN. Dadas las agudas diferencias encontradas en valores de densidad de especies formadoras de florecimientos respecto a las reportadas por otros autores en fechas similares, es importante realizar pruebas de calibración para descartar posibles errores en conteos celulares. Algal blooms are exponential growths of microalgae populations that occur spontaneously in aquatic environments. Generally, such blooms are harmful for several reasons, due to the presence of chemical (toxin production, see Table 1, reactive oxygen species, and anoxia), physical (decreased transparency, obstruction, or lacerations of fish gills) (Smayda, 1997), or biological agents (allelopathy, reduction of grazing pressure, and competition) (Kudela and Glober, 2012; Tang and Glober, 2012). Approximately 200 species of planktonic microalgae can produce toxins (Landsberg, 2002), and since they are primary producers in the food webs, their toxins can intoxicate or kill other organisms when consumed; humans may be affected if they consume contaminated fish or shellfish species (Hallegraeff, 2010). Other effects are due to the fact that when algae form blooms, they die quickly and bacterial decomposition of such biomass causes anoxia, which affects and kills aquatic animals at different trophic levels (Anderson, 2007). Additionally, other microalgae that produce blooms are harmful to fish because they have thick and sharp structures (spines, setae, horns) that damage or block gills or cause an irritation that produces thick mucus that suffocates fish (Corrales and Maclean, 1995). Table 1: Cell density criteria for considering a Harmful Algae Bloom (HAB) of toxic or harmful phytoplankton species, including the type of poisoning and damage they produce to other organisms. *Phaeocystis antartica G. Karst., P. globosa Scherff. and P. pouchetii (Har.) Lagerh. ** In Alexandrium spp. and Karenia spp. the abundance of 5 x103cells L-1 can render oysters toxic and, therefore, a risk to human health. However, a bloom for these species is considered when their abundances exceed 20-50 ×103cells L-1 (Steidinger pers. comm.). It is important to distinguish between bloom and harmful algal bloom (HAB), because even though a species might be classified as toxic or harmful, toxins are sometimes synthesized under certain environmental circumstances only (Trainer et al., 2012), or with the help of symbiotic bacteria (Azanza et al., 2006). In addition, because toxins do not affect the same type of organisms, classification of the harmfulness of a bloom also depends on the presence of a sensitive organism or a vector that passes the toxins to humans. Hence, the effect of noxiousness often occurs when the presence of a toxic or noxious algal strain in high density is combined with the organisms it affects. Formally, blooms are considered HABs only when they have a negative effect on the environment or when they pose a risk to human health (Hallegraeff, 2010). However, cell density alone can often be a good estimator for detecting HABs. Tesfay (2011) obtained a significant positive correlation between the cellular density of Prorocentrum lima (Ehrenb.) F. Stein and the production of its toxins; while Savela et al. (2016), studying Alexandrium ostenfeldii (Paulsen) Balech & Tangen, and its gene STXA4 involved in the production of saxitoxins, found that cell density was highly related to the number of copies of the gene in a natural bloom, and therefore the cell density predicted HAB toxicity very accurately. Acapulco Bay, an important maritime cargo port located in the southern portion of the Mexican Pacific, is a major tourist destination in the country, with approximately nine million tourists per year (Ramírez-Sáiz, 1987). In this locality high densities of phytoplankton algae have been recorded in the water column at certain times. These blooms are generally composed of one or a few species (monospecific bloom), which can even cause changes in the water color, known as red tides (Meave del Castillo and Zamudio-Resendiz, 2014; Pérez-Cruz et al., 2014). Since most of the toxic algae that form HABs affect humans, it is important to record the species and seasons in which they produce HABs in Acapulco, in order to understand the risk that they pose to marine fauna or public health. The objective of this study was to document the species which formed blooms in Acapulco between 2000 (when the authors began their studies in that location) and 2015, based on cell density and high relative abundance. The methodology consisted of recording dates and locations where such events occurred, maximum values of cell density, and whether such species have been reported as harmful or toxic elsewhere, in order to register blooms that could actually be classified as HABs, as well as observing the existence of these events with ENSO. Acapulco Bay is located on the coast of the state of Guerrero in the Mexican tropical Pacific (99°50'52''-99°56'00''W, 16°47'00''-16°51'40''N) and its shape is semicircular (10 × 7 km) (Fig. 1). Being surrounded by mountains, the bay resembles an amphitheater and has a depth that varies from 10 to 45 m near the mouth; the sediments are composed of thick sands that are thinner towards the mouth (Bolongaro, 2014). The climate is tropical rainy, with rains during the summer (Aw), temperatures higher than 18 °C throughout the year, and average rainfall greater than 100 mm ( x =165.4 mm) between June to October, and values close to 4 mm ( 𝑥 =4.16 mm) between November to May (Mayo-Vera, 2004). Based on recorded data of temperature, water salinity, and precipitation, three different seasons occur in this portion of the Mexican Pacific: a rainy season (June to October), a dry-cold season (November to March) and a dry-warm season (April to May) (Zamudio-Resendiz et al., 2014). Figure 1: Location of Acapulco Bay, Guerrero, Mexico, with collection sites, showing the topography surrounding the bay and bathymetry of the coastal zone. Black points correspond to collection sites from 2000 to 2008, red points to collection sites from 2009 to 2015. This small bay has a megadiverse phytoplankton flora (Meave-del Castillo et al., 2012). To date, 730 taxa have been recorded, including species, varieties, and forms (Meave-del Castillo et al., 2012; Rojas-Herrera et al., 2012a, b; González-Rivas, 2014; Zamudio-Resendiz et al., 2014; Pinzón-Palma, 2015), mainly of dinoflagellates and diatoms, the most studied groups in Acapulco. In addition to having a rich composition, the phytoplankton community of Acapulco is also diverse, as the calculated H´ values reach up to 4 (Zamudio-Resendiz, pers. comm.). This rich and diverse flora can be explained by the oligo-mesotrophic-trophic state prevailing in the bay (Varona-Cordero et al., 2013). Given the geomorphological characteristics of Acapulco, during the rainy season it receives runoffs enriched with solid and dissolved organic matter (4086.58 m3/year, Sampedro-Rosas et al., 2014). Yet this mesotrophic environment is partly preserved due to deep ocean currents, which enter and circulate within it with a cleansing effect (Dionni and Romo, 1984). Additionally, Meave-del Castillo et al. (2012) recorded that the phytoplankton community has a variety of nutrition types, 34% being heterotrophic or mixotrophic organisms, and several of them osmotrophs, consuming organic matter, which certainly helps depuration of the bay. Sometimes, algal communities of Acapulco are exposed to high concentrations of nutrients; in the rainy season phosphates rise considerably (Meave-del Castillo et al., 2012). The increase in nutrient concentration comes from the entry of contaminated water from multiple temporary streams (Fig. 1), loaded with sewage and garbage that descend from the mountains and drain into the bay (Sampedro-Rosas et al., 2014). In this respect, the phytoplankton flora of Acapulco has shown to be quite resilient; hence, in spite of the contamination and decrease of salinity in the surface layer of the column water to which the bay is exposed during the rains (that apparently affect the phytoplankton, because in August and September the community decreases), the community recovers shortly thereafter, in approximately two months (Meave del Castillo and Zamudio-Resendiz, 2013). A total of 526 samples were obtained in 35 collections at several locations from May 2000 to November 2015 (Fig. 1). Four hundred twenty-three samples were collected with Van Dorn bottle at different depths (1, 3, 5, 10, 30, and 50 m) and fixed in situ with Lugol’s iodine solution, while 103 were collected with a 54 μm mesh phytoplankton net, and fixed with formaldehyde at a final concentration of 4% (Table 2). In 2010, an intensive sampling was carried out, involving monthly collections with net and bottle in eight locations, four inside the bay and another four in the surrounding coastal area indicated in red in figure 1. The collection dates were classified in one of Acapulco’s three climate seasons: dry-warm, dry-cold, and rainy (Table 2). The highest number of collections was made in the dry-cold season (15), and the lowest during the dry-warm season (6). Simultaneously with the collections, physical-chemical parameters (temperature, salinity, pH, and dissolved oxygen) were measured with multiparameter water quality instruments (YSI-556MPS, YSI-550A, Yellow Springs, USA; Thermo-OrionStarTM, Thermo Fisher Scientific Inc., Yellow Springs, USA). Water collected with a Van Dorn bottle was filtered in situ with a Millipore filtration system (Merck KGaA, Darmstadt, Alemania) and Whatman GF/F filters and frozen immediately, to be evaluated later in the laboratory. We measured concentrations of phosphate, silicate, ammonium, nitrites, and nitrates. The techniques for evaluating the nutrients are described in Meave-del Castillo et al. (2012). Atmospheric temperature and precipitation values were obtained from the meteorological station No. 768050 of the National Meteorological System (NMS). Table 2: Phytoplankton samples collected in Acapulco Bay, Guerrero, Mexico, from 2000 to 2015, and asterisk (*) indicates the dates on which a bloom was found. For the identification of the taxa, the samples were observed with an optical microscope (Leica DMLB, Wetzlar, Germany), with bright field, phase contrast, epifluorescence, and integrated digital camera. In some cases, the morphology of the organisms was studied with the SEM (JEOL JSM-5900LV, Tokyo, Japan). For this purpose, samples were first fixed in the field with 2.5% glutaraldehyde and subsequently subjected to a second fixation in the laboratory with osmium tetroxide. For sensitive organisms this method was followed to critical point drying (Boltovskoy, 1995). The species were identified from morphological and morphometric characters indicated in the specialized taxonomic literature. The cell density was evaluated with the Utermöhl method (Edler and Elbrächter, 2010), using chambers with 50 ml columns, and an inverted microscope (Motic AE31, Carlsbad, Canada). Relative abundance was estimated in both net and bottle samples by counting all the species under the microscope, or until reaching 400 cells and converting the absolute data into percentages. We used the parameter of cellular densities of the taxa recorded as HAB in the literature as a criterion for considering a bloom (Table 1). Since our intention was also to evaluate the risk to human health of these events, we obtained information from the literature regarding whether the species had or had not been reported as a harmful or toxic species in Mexico or anywhere else in the world and, in the case of toxic substances, the type of poisoning they produce (Table 1). To complement this information, we undertook a search in the literature for reports of microalgae blooms in Acapulco during the study period. To observe whether there was a relation between global climatic factors (ENSO) and HABs, we located the dates of blooms in Acapulco in a temperature anomalies graph constructed with the standardized values of Multivariate ENSO Index (MEI) with 324 data points from 1989 to 2015 (Klause, 2016), obtained from the U.S. Department of National Oceanic and Atmospheric Administration (NOAA). In the case of Gymnodinium catenatum Graham and Pyrodinium bahamense var. compressum (Böhm) Steid., Tester & F.J.R. Taylor, the maximum abundances in each of the recorded HABs were plotted to visualize the relationship of the MEI not only with the presence of the HAB, but also with the maximum values of abundance reached by the species. The lack of Gymnodinium catenatum and Pyrodinium bahamense var. compressum abundance data for dates when they do not produce bloom in Acapulco prevented using statistical tests to evaluate the significance of the relationship of the HAB with the standardized MEI values. Therefore, to evaluate the significance of the relationship, the nonparametric Olmstead-Tukey Corner Test of Association was used (Olmstead and Tukey, 1947; Steel and Torrie, 1980), evaluating the absolute value of quadrant sum obtained from the plot done. The method considered that “the extreme values are often the best indicators of an association between variables and this test gives them special weight” (Steel and Torrie, 1980) and the accuracy of the level of significance is independent of sample size (Olmstead and Tukey, 1947). When the HAB lasted a long time, the maximum value of abundance was located in the middle of the event. In the case of Gymnodinium catenatum, a matrix was constructed with 16 values obtained from other authors and bi-monthly values obtained by us from March 2010 to January 2011. For Pyrodinium bahamense var. compressum the matrix had data for only eight abundances because this species sporadically occurred in the bay. According to the criteria used, we recorded 53 blooms and 37 microalgal outbreaks registered by other authors in the same period were added to the list, resulting in a total of 90 microalgal blooms in Acapulco during our study period (2000-2015). Hence, we registered 88.6% of the diatom blooms and 40% of the dinoflagellates ones, meaning that 58.8% of the collections performed in Acapulco during this study had at least one sample with a bloom (Tables 3, 4). Table 3: Data of 35 blooms recorded in Acapulco Bay, Guerrero, Mexico (2000 to 2015), conformed of 21 diatom taxa. Harmful Algal Bloom/Toxin (HAB/Tox): without apparent harm (WAH), harmful (H), toxic (T), domoic acid (DA). Maximum density recorded in Acapulco (D), relative abundance of bloom species (RA), depth at which they were located (Z). Season (S): dry-cold (DC), rainy season (R). Sea surface temperature anomalies (AT): El Niño condition (+), La Niña condition (-). Reports of harmfulness in other regions: H1=Landsberg (2002); H2=Sunesen et al. (2009). Blooms marked with asterisks (*) are events reported of bloom in Acapulco by other authors. Table 4: Data of 55 blooms recorded in Acapulco Bay, Guerrero, Mexico (2000 to 2015) conformed of 19 dinoflagellates taxa. Harmful Algal Bloom/Toxin (HAB/Tox): without apparent harm (WAH), harmful (H), toxic (T), saxitoxin (STX), yesotoxin (YTX), okadaic acid (OA). Maximum density recorded in Acapulco (D), relative abundance of bloom species (RA), depth at which they were located (Z), season (S): dry-cold (DC), dry-warm (DW), rainy season (R). Sea surface temperature anomalies (AT): El Niño condition (+), La Niña condition(-). Blooms marked with asterisks (*) events reported of bloom in Acapulco by other authors see Tables 5-6. Abundance values with (?) = extremely high values that are doubtful. Most (18) of the diatom blooms (51.4%) occurred during the rainy season, followed by the dry-cold season (48.6%) (Table 3), and were composed of centric species, usually organized in chains or filaments (such as Chaetoceros spp. ), although we also recorded some of the pennate types, such as Pseudo-nitzschia spp. and Thalassionema nitzschioides (Grunow) Mereschk. (Table 3). Additionally, most of the dinoflagellate blooms occurred in the dry-cold season (50%), mainly by Dinophysis caudata Kent, Karenia longicanalis Yang, Hodgkiss & G. Hansen and Pyrodinium bahamense var. compressum, but other dinoflagellate outbreaks occurred in the rainy season (37%, Table 4): Akashiwo sanguinea (Hirasaka) G. Hansen & Moestrup), Margalefidinium polykrikoides (Margalef) F. Gómez, Richlen & D.M. Anderson (= Cochlodinium polykrikoides Margalef), Prorocentrum gracile F. Schütt, P. koreanum M.S. Han, S.Y. Cho & P. Wang, Scrippsiella acuminata (Ehrenb.) Kretschmann, Elbr., Zinssm., Soehner, Kirsch, Kusber & Gottschling (= S. trochoidea (F. Stein) A.R. Loebl. ), and Tripos balechii f. longus (Meave, Okolodkov & Zamudio) F. Gómez among them. No diatom blooms occurred at the dry-warm season, and only seven (13%) outbrakes of dinoflagellates occurred at this season corresponding to the species: Akashiwo sanguinea, Gymnodinium catenatum, Prorocentrum gracile, Tripos balechii (Meave, Okolodkov & Zamudio) F. Gómez f. balechii, and T. furca (Ehrenb.) F. Gómez (Table 4). We found that Gymnodinium catenatum was the dinoflagellate that reached the highest density (2.3 × 106cells L-1) in the bay of Acapulco during the study period, although reports of other authors mention maximum densities of Margalefidinium polykrikoides of 28.1 × 106cells L-1 in this location during September-October 2011 (Table 4). Although the number of cells that such species must reach to produce harmful effect on biota is different: 5 × 103cells L-1 vs 500 × 103cells L-1 (Table 1), the values reached by both species in Acapulco far exceed such numbers. Thirty-five blooms were caused by diatoms (Table 3) and 55 by dinoflagellates (Table 4). Considering the damage caused by the taxa that created the blooms, 21 (17 formed by diatoms and 4 by dinoflagellates) were classified as WAH (without apparent harm), because no deleterious effect on aquatic organisms or humans has ever been mentioned. Another 20 (8 formed by diatoms and 12 by dinoflagellates) were harmful blooms (H) and 47 (10 formed by diatoms and 37 by dinoflagellates) were classified as toxic outbreaks (T) (Tables 3, 4). As a consequence, the highest percentage (48.6%) of diatom blooms in Acapulco is classified as WAH (Fig. 2A), while the highest percentage of dinoflagellate blooms is T (67.3%) (Fig. 2B). Blooms were composed of 40 taxa: 21 diatoms (Table 3, Figs. 3A-R, 4A-D) and 19 dinoflagellates (Table 4, Figs. 5A-N). Of the species, ten diatoms were classified as WAH (without apparent harm), seven as H (Harmful), and four as T (Toxic), while for dinoflagellates, three taxa were classified as WAH, seven as H, and seven as T species. Two dinoflagellate blooms could not be classified because the species were not properly identified (Table 4). Figure 2: A. Percentage of diatom blooms; B. Percentage of dinoflagellate blooms recorded in Acapulco Bay, Mexico (2000 to 2015); classified for its effect. Without apparent harm (WAH), harmful (H), toxic (T). Figure 3: Diatom taxa that produce blooms in Acapulco, Guerrero, Mexico. A. Chaetoceros curvisetus Cleve, Light microscopy (LM); B. C. debilis Cleve (LM); C. C. laciniosus F. Schütt (LM); D. C. lorenzianus Grunow (LM); E. C. radicans F. Schütt, Scanning Electron Microscopy (SEM); F. C. socialis Lauder (LM); G. C. tortissimus Gran (LM); H. C. wighami Brightw. (LM); I. Climacodium frauenfeldianum Grunow (LM); J. Guinardia delicatula (Cleve) Hasle (LM); K. Hemiaulus hauckii Grunow ex Van Heurck (SEM); L. Leptocylindrus danicus Cleve (LM); M. L. minimus Gran (LM); N. Pseudo-nitzschia delicatissima (Cleve) Heiden (LM); O. P. pungens (Grunow ex Cleve) Hasle (LM); P. P. pseudodelicatissima (Hasle) Hasle (LM); Q. P. seriata (Cleve) H. Peragallo (LM); R. P. subfraudulenta (Hasle) Hasle (LM). Scales: A, F, G, J, N-R=20 µm; B, E, H, L, M, T=10 µm; C, D, I=50 µm; K=5 µm. Figure 4: Diatom taxa that produce blooms in Acapulco, Guerrero, Mexico. A. Skeletonema pseudocostatum Medlin, Scanning Electron Microscopy (SEM); B. S. tropicum Cleve (SEM). C-D. Thalassionema nitzschioides (Grunow) Mereschk. (SEM), Light microscopy. Scales: A=2 µm; B, C-D=5 µm. Figure 5: Dinoflagellate taxa that produce blooms in Acapulco, Guerrero, Mexico. A. Akashiwo sanguinea (Hirasaka) G. Hansen & Moestrup, Light microscopy (LM); B. Margalefidinium polykrikoides (Margalef) F. Gómez, Richlen & D.M. Anderson (= Cochlodinium polykrikoides Margalef) (LM); C. Dinophysys caudata Kent, Scanning Electron Microscopy (SEM); D. Gymnodinium catenatum Graham (LM); E. Karenia longicanalis Yang, Hodgkiss & G. Hansen (LM); F. Lingulodinium polyedra (F. Stein) J.D. Dodge (SEM); G. Prorocentrum gracile F.Schütt (SEM); H. P. koreanum M.S. Han, S.Y. Cho & P. Wang (SEM); I. Protoperidinium crassipes (Kof.) Balech (LM); J. P. divergens (Ehrenb.) Balech (SEM); K. Pyrodinium bahamense var. compressum (Böhm) Steid., Tester & F.J.R.Taylor (LM); L. Scrippsiella acuminata (Ehrenb.) Kretschmann, Elbr., Zinssm., Soehner, Kirsch, Kusber & Gottschling (SEM); M. Tripos balechii f. balechii (Meave, Okolodkov & Zamudio) F. Gómez (SEM); N. T. furca (Ehrenb.) F. Gómez (SEM). Scales: A, B, D, K, M=20 µm; C, E-J, L=10 µm; N=50 µm. 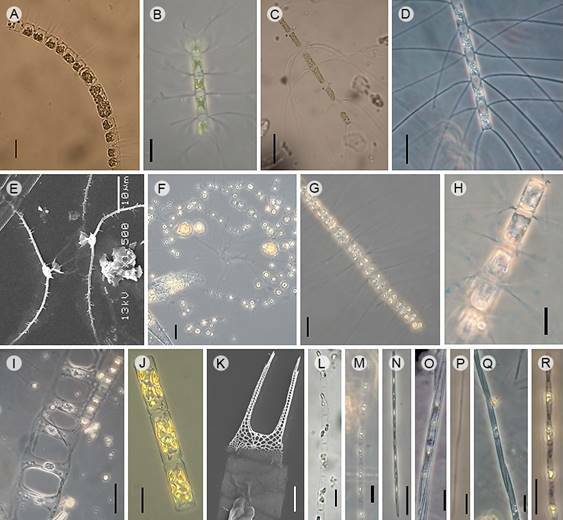 Thirteen taxa (34.2%) are WAH species: 10 diatoms (Chaetoceros curvisetus Cleve, C. laciniosus F. Schütt, C. radicans F. Schütt, C. tortissimus Gran, Climacodium frauenfeldianum Grunow, Hemiaulus hauckii Grunow ex Van Heurck, Pseudo-nitzschia subfraudulenta (Hasle) Hasle, Thalassionema nitzschioides, Skeletonema pseudocostatum Medlin, and S. tropicum Cleve), and three dinoflagellates (Karenia longicanalis, Prorocentrum gracile, and Protoperidinium divergens (Ehrenb.) Balech). Even these species can be beneficial for increasing primary productivity of the system. The diatom Skeletonema pseudocostatum had the highest densities (668 × 103cells L-1) in Acapulco during July 2008 at Sinfonía station. Of the dinoflagellates only the density of Karenia longicanalis could be evaluated with maximum values of 72.6 × 103cells L-1 . Fourteen (36.8%) taxa have been reported as Harmful (H), of which seven diatoms (Table 3): Chaetoceros debilis Cleve, C. lorenzianus Grunow, C. socialis Lauder, C. wighami Brightw., Guinardia delicatula (Cleve) Hasle, Leptocylindrus danicus Cleve, and L. minimus Gran, and seven dinoflagellates (Table 4): Levanderina fissa (Lavander) O. Moestrup, Hakanen, G. Hansen, Daugbjerg & Ellegaard, Noctiluca scintillans (Macartney) Kof. & Swezy, Prorocentrum koreanum, Scrippsiella acuminata, Tripos balechii f. balechii, T. balechii f. longus, and T. furca (Ehrenb.) F. Gómez. The diatom Leptocylindrus minimus had the highest densities (287 × 103cells L-1) in Acapulco during March 2010 at Bocana station. Of the dinoflagellate blooms evaluated by us, Scrippsiella acuminata reached the maximum density in Sinfonía station with a value of 121 × 103cells L-1 . Eleven species (28.9%) taxa have been reported as Toxic (T), four diatoms (Table 3) and seven dinoflagellates (Table 4). The four toxic diatoms belong to the genus Pseudo-nitzschia and are domoic acid (DA) producers. Only P. pseudodelicatissima (Hasle) Hasle was recorded with high densities on several occasions, with values varying from 10.5 × 103 to 306 × 103cells L-1, and a relative abundance of 8 to 82% (Table 3). Toxic dinoflagellates that cause HABs were Akashiwo sanguinea, Dinophysis caudata, Gymnodinium catenatum, Lingulodinium polyedra (F. Stein) J.D. Dodge, Margalefidinium polykrikoides, Protoperidinium crassipes (Kof.) Balech, and Pyrodinium bahamense var. compressum, whose type of poisoning and toxin is mentioned in Table 4. There were three blooms of Akashiwo sanguinea whose density could not be evaluated, but whose relative abundance reached 80% in June 2003. Two blooms of Margalefidinium polykrikoides (mainly a reactive oxygen species producer) were found, one during June 2007, with a relative abundance of 82%, and another in November 2015, with an abundance of 1.3 × 106cells L-1. Other red tides of this species (11/2002, 06/2003) were observed during the period, but their density could not be evaluated because the cells agglutinated quickly, although they were fixed in situ with Lugol’s iodine solution. Another five blooms were registered in the rainy season by Gárate-Lizárraga et al. (2016), in which these species reached higher densities (Table 4). Three blooms of Dinophysis caudata, an okadaic acid (OA) producer, were registered during the dry-cold season, reaching a maximum density of 11.1 × 103cells L-1 in January 2011 in Pto. Marqués station. These blooms were not monospecific, since D. caudata was codominant with several species and its maximum relative abundance ranged from 0.9 to 1.8%. A single bloom of Lingulodinium polyedra, a yessotoxin (YTX) producer, was found in Acapulco in the dry-cold season, 27-28 March 2014, outside the Acapulco Bay at the station called Oceánica, i.e., with densities up to 280 × 103cells L-1. Four days later (April 1, 2014), Pérez-Cruz et al. (2014) recorded the species with a density of 6.4 × 106cells L-1. The relative abundance of these species was 37%, co-dominating with Karenia sp., Gymnodinium catenatum, and Leptocylindrus sp. An outbreak of Protoperidinium crassipes was reported by Gárate-Lizárraga et al. (2016), but without relative abundance or density data. We found this species frequently in Acapulco, with low densities (67-96 cells L-1, Meave-del Castillo et al., 2012). The dinoflagellate species that produce HAB in Acapulco are Pyrodinium bahamense var. compressum and Gymnodinium catenatum, both saxitoxin (STX) producers, the latter being the most frequent with 12 blooms registered in Acapulco during the study period. This species blooms at the end or beginning of the year and rarely during the rainy season (Table 4). Three blooms of Gymnodinium catenatum, a saxitoxin producer, were recorded in the dry-cold season, reaching a maximum density of 2.3 × 106cells L-1, during March 2014, at la Naval; these blooms even caused a reddish discoloration of the water and a concentration of saxitoxins in shellfish of 478 μgSTXeq.100g-1 shellfish (Pérez-Cruz et al., 2014). The relative abundances in these events varied from 27 to 88%, with the highest value in June 2003. Another ten HAB of G. catenatum were recorded by other authors both in the dry-cold and rainy seasons (Tables 4-5), reaching a maximum density of 54.4 × 103cells L-1 in El Niño condition (Gárate-Lizárraga et al., 2016). Table 5: Harmful Algae Blooms of Gymnodinium catenatum Graham reported in Acapulco Bay, Guerrero, Mexico. Data of maximum density, toxin concentrations in shellfish and sea surface temperature anomalies (AT): La Niña condition (-) or El Niño condition (+); are indicated. * This value seems to be overvalued because it was measured on the same dates as other authors and exceeds in two orders of magnitude such values (Bustamante-Gil, 2011; Rojas-Herrera et al., 2012b). Pyrodinium bahamense var. compressum was recorded throughout the month of July 2010, on July 10th reaching the highest density of 774 × 103cells L-1 at the center of the bay, at 3 m (Table 4). A week later (July 17th, 2010) it had already decreased its density (52.3 × 103cells L-1in Pta. Bruja, at 5 m). This HAB produced a toxin concentration up to 2092 μgSTXeq 100g-1 shellfish (COFEPRIS, 2010) (Table 6), which caused the Federal Commission for the Protection Against Health Risks (COFEPRIS, 2010) to declare a sanitary closure, since according to an emerging standard, alerts are emitted after 80 μgSTXeq 100g-1shellfish (SSA, 2001). This species reached values greater than 5 × 103cells L-1 at all stations within the bay and on external sites near the bay of 3 to 10 m deep (53% of the tested samples). However, no discoloration of the sea was observed during these events. In the open sea where Z>50 m, the species had values of 3 × 103cells L-1 at depths between 1 and 3 m. A week before (7/July/2010), Laboratorio Estatal de Salud Publica del Estado de Guerrero staff (COFEPRIS, 2010) registered the HAB with a density of 1.4 × 106cells L-1 at Puerto Marqués station, which indicates that the bloom had started some time before and was already decaying when we recorded it. During August, the density inside the bay was very low but began recovering in September until reaching 7 × 103cells L-1 (Center, 10 m). By November, it was present throughout the bay with values up to 16 × 103cells L-1 (Punta Bruja, 10 m) and just in January (Naval 1 to 3 m) reached and abundance of 22 × 103cells L-1. Table 6: Harmful Algae Blooms of Pyrodinium bahamense var. compressum (Böhm) Steid. Tester & F.J.R. Taylor, reported in locations of the eastern tropical Pacific. Date, maximum densities, toxin concentrations in different animals, and sea surface temperature anomalies (AT): La Niña conditions (-) are indicated. * In this HAB three people died, seven became ill and 206 turtles died. 1Toxins evaluated in mollusks (Stomolophus meleagris L. Agassiz). 2Toxins evaluated in turtles (Lepidochelys olivaceae Eschscholtz and Chelonia sp.). 3Toxins evaluated in jelly fish. Some algae blooms in Acapulco were multispecies; for example, in November 2010 the event recorded in La Bocana included Gymnodinium catenatum and Dinophysis caudata, the latter reached high densities (10.9 × 103cell L-1) but low values of relative abundance (1.8%). Also on the same date, blooms of different species were found in different locations. For example, in June 2003, Tripos balechii and Akashiwo sanguinea formed blooms at the center of the bay, while Gymnodinium catenatum bloomed in La Naval, and Leptocylindrus danicus in La Bocana. We also observed that in some cases before a HAB, several species were co-dominating and later one of them produced a monospecific HAB. For example, on March 1, 2014, Gymnodinium catenatum (3.5-46.5%), Leptocylindrus danicus (15-27%), and Cylindrotheca closterium (Ehrenb.) Reimann & J.C. Lewin (18.5-48.8%) were recorded; and at the end of the month (March 27), Gymnodinium catenatum reached a relative abundance of 15-74%. Another 52 phytoplankton taxa (Table 7) were recorded in Acapulco, which have caused HABs in other regions, but until now they have only been found in low densities at this location, and were thus considered as potential HAB-forming taxa. The maximum relative densities and abundance found in Acapulco, as well as the type of toxin or damage they produce are shown in Table 7, which lists 28 species that have the potential to be toxic and 24 to be harmful. Most of these dinoflagellates (44.2%) could form toxic HABs, whereas most diatoms would produce harmful blooms (36.5%). The other groups (Haptophyta, Raphidophyta, and Cyanophyta) belong to only 9.6% of the total species, but should they bloom, their HAB could be toxic. Table 7: List of phytoplanktonic taxa potential forming Harmful algal blooms (HAB) in Acapulco Bay, Guerrero, Mexico (sorted by algal group and alphabetical order), recorded in the literature as harmful (H) or toxic (T). Toxin type: domoic acid (DA), saxitoxins (STX), okadaic acid (OA), dinophysis toxins (DTx), pectenotoxins (PTx), breve toxins (PbTx), brevisulcata toxins (KBTx, (DTx), brevesulcatic acid (BSX), superoxidant agents (ROS), yesotoxins (YTx), azaspiracides (AZP), chatonella toxins (CaTx), fibrocapsa toxins (FjTx) and polyunsaturated aldehydes (PUAs). Frequency data (Frec.) and maximum density (D) achieved in the bay are given; density not determined since the taxa was found only in net samples (ND). References: 1) Eilertsen and Raa (1995); 2) Shamsudin et al. (1996); 3) Balech (2002); 4) Landsberg (2002); 5) Fryxell and Hasle (2003); 6) Taylor et al. (2003); 7) Hallegraeff and Hara (2003); 8) Hansen et al. (2004); 9) Hsia et al. (2006); 10) Proenza et al. (2009); 11) Steidinger (2009); 12) Sunesen et al. (2009); 13) Guidi-Rontani et al. (2010); 14) Fowler et al. (2015); 15) Akselman and Fraga (2016); 16) Fraga (2016); 17) Hansen (2016); 18) Hoppenrath and Elbraechter (2016); 19) Lundholm (2016); 20) Moestrup (2016) a; 21) Moestrup (2016b); 22) Zingone and Larsen (2016). *= Usually Phalacroma rotundatum is not a toxic species, but some authors reports that it may contain DTx (Zingone and Larsen, 2016). Algae group/Taxa HAB Toxin Reference Frec. (%) D (cells L-1). Physical-chemical parameters were obtained from 700 data in the monthly collections made in 2010 (Meave del Castillo, 2012) and the sporadic data measured during the samplings carried out during the entire study period (2000-2015). Water temperature had a range of 16.43-31.03 °C ( 𝑥 =27.37 °C), with the highest values in August 2010. Beginning in April, water temperature rises and in September it decreases, with the lowest values in February-March. Salinity ranged from 29.5-38.31 throughout the year ( 𝑥 =34.04); during the rainy season and until December, salinity is lower than in the dry season (November to May). Dissolved oxygen varied from 0.52 to 11.19 mg L-1 ( 𝑥 =5.96 mg L-1), decreasing during the dry-cold season (December to March). Nutrients had the following concentrations: P-PO4=0.001-13.59 μM ( 𝑥 =1.7 μM), N-NO2=0.001-22.33 μM ( 𝑥 =0.53 μM), N-NO3=0.001-27.64 μM ( 𝑥 =2.6 μM), N-NH4=0.0001-33.42 μM ( ?? =2.44 μM), SiO2=0.0001-8.42 μM ( 𝑥 =0.79 μM), chlorophyll a=0.001-46.27 mgL-1 ( 𝑥 =4.91 mgL-1). Generally in Acapulco, we have observed that phosphate increases in the rainy season, which coincides with the increase of air temperature in the water column. Ammonium and silicates have low values, which remain more or less constant throughout the year, while nitrites + nitrates increase in the dry-cold season. Acapulco monthly rainfall data, obtained from the NMS (National Meteorological System), for a period of 30 years (1973-2010), show that August is the rainiest month of the year, with an average close to 200 mm. In particular, the year 2010 was very rainy, and in August values close to 500 were reached (Meave del Castillo, 2012; Meave-del Castillo et al., 2012). The dates of the blooms on the graph of temperature anomalies show that the majority of blooms (75.6%) occurred during negative anomalies (La Niña conditions) of the historical average value of MEI obtained during 27 years (1989-2015) (Fig. 6A), for example, Pyrodinium bahamense var. compressum. On the other hand, twelve blooms of Gymnodinium catenatum were found eight in La Niña (66.7%) and four (33.3%) in El Niño conditions, e.g., at the end of 2009 (October to December). When the species occured in El Niño conditions, densities are low: maximum abundances were 6.2-17.3 × 103cells L-1 (Table 5, Fig. 6B). The value of 13 × 106cells L-1 reported by Gárate-Lizárraga et al. (2016) seems to be overvalued, because it was measured on the same dates as other authors and exceeds such values in two orders of magnitude. Figure 6: A. Location of the dates of the HAB events of Gymnodinium catenatum Graham and Pyrodinium bahamense var. compressum (Böhm) Steid., Tester & F.J.R.Taylor in the tropical eastern Pacific, on the graphic of temperature anomalies of the Pacific. The graph was constructed with monthly values of the ENSO Multivariate Index (MEI) from 1989 to 2015. The MEI includes six climatic variables. Positive anomalies indicate that the temperature observed was warmer than the historical average, negative anomalies indicate that the observed temperature was colder than the historical average. Values above 1.0 or below -1.0 indicate conditions El Niño or La Niña respectively. B. Graphic of abundances of Gymnodinium catenatum and Pyrodinium bahamense var. compressum on the dates in which they produced HAB in Acapulco Bay, Mexico. On the other hand, in Figure 7, corresponding to the Corner Test for Association, it is observed that quadrant sums resulted in a value of 13. Using the table of significance levels for magnitudes of quadrant sums contained in Olmstead andTukey (1947), this value was significant (p=0.000036), which means that despite the few data included in the analysis, the relationship of the development of HAB of these noxious species with climatic conditions tending to La Niña or even in La Niña can be accepted. 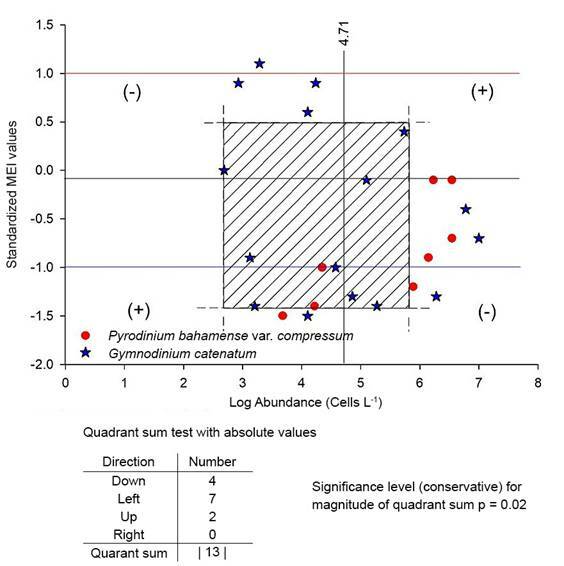 Figure 7: Location in the Olmstead-Tukey quadrants of the abundance levels with respect to the standardized MEI values for Gymnodinium catenatum Graham and Pyrodinium bahamense var. compressum (Böhm) Steid., Tester & F.J.R.Taylor when they formed HAB in Acapulco Bay, Mexico. Fifty-three blooms of 40 species were found. A literature review showed at least 30 additional blooms reported by other authors who work at local institutions and can make collections in the bay at any time (Rojas-Herrera et al., 2012a, b; Pérez-Cruz et al., 2014, 2016; Moreno-Díaz et al., 2015; Gárate-Lizárraga et al., 2016). This means that with the 35 collections that we made during the study period, we were able to record 63.4% of the algal blooms that occurred in Acapulco (2000-2015). Most blooms recorded by other authors included species that, on a different occasion, we also found as blooms or as species that we recorded but at low densities, such as Karenia spp., Levanderina fissa and Noctiluca scintillans (Gárate-Lizárraga et al., 2016). Our results suggest that Acapulco blooms occurred in the rainy and dry-cold seasons; these results are due to the low number of collections (six) made during the dry-warm season, thus underestimating the results. Pérez-Cruz et al. (2014) and Gárate-Lizárraga et al. (2016) reported blooms of several dinoflagellates during this season, e.g. Gymnodinium catenatum in April 2012 (137 × 103cells L-1), May 2013 (2.72 × 106cells L-1), January 2014 (20 × 103cells L-1) and March-April 2014 (1.89 × 106cells L-1); Tripos furca (120 × 103cells L-1) in April 2012; Akashiwo sanguinea (10 × 106cells L-1) in May 2013; and Lingulodinium polyedra (6.4 × 106cells L-1) in March 2014. Most diatom blooms occurred during the rainy season (Chaetoceros curvisetus, Climacodium frauenfeldianum, Leptocylindrus danicus, Skeletonema pseudocostatum and Thalassionema pseudonitzchioides) or the dry-cold season (Guinardia delicatula, Leptocylindrus minimus and Pseudo-nitzschia spp.). These data are consistent with the bloom of Pseudo-nitzschia spp. recorded in February 2014 by Gárate-Lizárraga et al. (2016). The only diatom species, which by its densities and type of damage could have produced a HAB, was Pseudo-nitzschia pseudodelicatissima in November 2010, reaching a density of 306 × 103cells L-1 at Muelle. However, apparently these blooms did not affect aquatic organisms or human health in Acapulco. 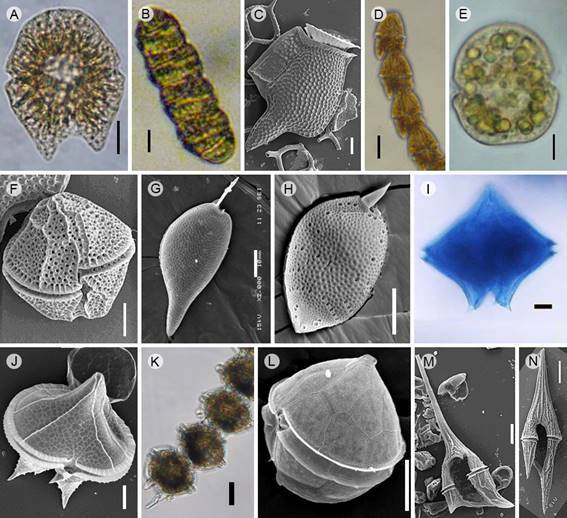 Likewise, 49% of dinoflagellate blooms occurred in the dry-cold season (Dinophysis caudate, Gymnodinium catenatum, a taxon of Kareniaceae family related to Takayama, Lingulodinium polyedra, and Pyrodinium bahamense var. compressum), while 37.7% occurred in the rainy season mainly from, Margalefidinium polykrikoides, Protopedinidium divergens and Scrippsiella acuminata. The rainy and dry seasons contrast because their environmental parameters (temperature, precipitation, salinity, and nutrients) change drastically (Meave-del Castillo et al., 2012), which makes it difficult to understand what factors are leading to the blooms, especially for diatoms, since silica concentrations in general are low in Acapulco ( 𝑥 =0.79 µM). It was found that most diatom blooms (85%) occurred in La Niña conditions or during a transition to La Niña. The only blooms that occurred in El Niño conditions were originated by Leptocylindrus minimus, Pseudo-nitzschia psedodelicatissima, Pseudo-nitzschia subfraudulenta, and Skeletonema tropicum. After recording the dates of the dinoflagellate blooms on the graph of temperature anomalies, we found that most occurred in La Niña conditions, although Akashiwo sanguinea, Dinophysis caudata, Prorocentrum gracile, Prorocentrum koreanum. Scrippsiella acuminata, and Tripos balechii bloom during El Niño conditions. The Karenia longicanalis bloom reached a significant cell density of 72.6 × 103cells L-1, but was classified as WAH, because it did not produce any apparent damage in Acapulco. This agrees with the observation of the bloom of this species in Hong Kong during May 1998 that was also not harmful and characterized as a non-producing species of brevetoxins (PbTx) (Yang et al., 2001). We note the density values found by Gárate-Lizárraga et al. (2016) for the bloom of Karenia sp. and Kareniaceae cf. Takayama in February 2012 and December 2007, with 88 × 106 and 13 × 107cells L-1, respectively. These data seem to be overvalued because these species are relatively large (ca. 40 μm) and authors such as Yang et al. (2001) report densities of up to 180 × 103cells L-1 in massive blooms of K. longicanalis in China. Prorocentrum gracile and Protoperidinium divergens classified as WAH were considered innocuous in spite of registering high relative abundance values (80%), because in the literature they have never been identified as producing toxins or causing anoxia. The bloom of Levanderina fissa had high densities (2.1 × 106cells L-1) in Acapulco (January 2012); however, it was not considered a HAB producer at that time because its densities must exceed 13 × 106cells L-1 to produce anoxia (Jiménez, 1993). Additionally, the maximum density recorded in Acapulco by Noctiluca scintillans did not appear to be very high (603 × 103cells L-1), although it could have a negative effect on the environment, because its density exceeded the value of 500 × 103cells L-1 reported by Adnan (1989) to cause massive mortality of marine organisms. This species causes damage because it increases the ammonium concentrations in the water and reduces the O2 for its heterotrophic metabolism. All blooms can cause oxygen depletion when they decay because of decomposition of dead cells by bacteria. Blooms of Prorocentrum koreanum (usually identified as P. micans Ehrenb.) showed that it was only relatively abundant (>80%). It was not possible to evaluate the risk of outbreak produced by this species in Acapulco, since harmful effects are mentioned when their densities are higher than 1 × 106cells L-1. Prorocentrum koreanum was recently identified as a distinct species from populations of Prorocentrum micans, both by molecular techniques (secuences of ITS) and morphological features such as pattern of pores of trichocysts on valves and periflagellar platelets (Han et al., 2016). Since all the reports in Acapulco relating to these taxa have been named P. micans, it would first be necessary to identify the Acapulco specimens properly to know if both species are present and which taxa produces the blooms and whether that species is harmful or not. Scrippsiella acuminata is a species that frequently produces blooms that had been considered non-toxic or harmful, with only an old report that indicated it caused anoxia (Whitelegge, 1891). Recently, however, it has been found that even at low densities (1 × 104cells L-1) it affects larvae of bivalve mollusks, because it prevents their feeding (Tang and Glober, 2012). In October 2009 in Acapulco, abundance far surpassed (121 × 103cells L-1) these density values and since there are bivalve banks on the rocky shores of the bay, it is possible that this species could have a negative effect on these benthic communities. Within the species of Tripos (= Ceratium) bloom producers, we recorded two in Acapulco (Tripos furca, Tripos balechii f. balechii and Tripos balechii f. longus). Tripos furca has been mentioned as a noxious species affecting fish either by anoxia or by increasing ammonium concentrations (Matthews and Pitcher, 1996; Orellana-Cepeda et al., 2004); however, in Acapulco this species did not reach the densities (1 × 107cells L-1) mentioned in those references that are necessary to produce harmful effects. Nevertheless, T. balechii in Acapulco reached densities of up to 12 × 106cells L-1 (Gárate-Lizárraga et al., 2016), which is considered a risk to benthic invertebrates because at St. Helena Bay, Africa, massive lobster mortality has been reported with densities of 7.3 × 106cells L-1 (Pitcherd and Probyn, 2011). The density data of 400 × 106cells L-1 recorded by Gárate-Lizárraga et al. (2016) during March 2012 may be incorrect, since the highest densities found by other authors on massive blooms are two orders of magnitude lower (Pitcherd and Probyn, 2011). Even in Mexico, the dense HAB of T. furca (a species of similar characteristics), that caused important harmful effects in the fauna of Baja California reported by Orellana et al. (2004), reached a maximum value of 1 × 106cells L-1. Unfortunately, in Acapulco it was not possible to evaluate the density of Akashiwo sanguinea blooms. However, during the event recorded in June 2003 it reached a relative abundance of 80%. The effects of this species that commonly forms red tides are contradictory in literature; older citations refer to it as toxic for mollusk larvae and adults and even fish (Nightingale, 1936; Tindall et al., 1984; Carlson and Tindall, 1985; Shumway, 1990). Landsberg (2002) points out that it is a producer of ROS, and Cortés-Altamirano and Hernández-Becerril (1998) maintain that it is a producer of PSP; both affirmations, however, seem to be erroneous. Other authors mention that Akashiwo sanguinea is not really toxic, but causes anoxia that can kill marine fish and invertebrates (Horner et al., 1997). The most modern references show that this species exhibits toxicity only to the larvae and embryos of abalone (Botes et al., 2003); relatively low densities of this species (3.1 × 105cells L-1) cause 50% larvae mortality. Furthermore, it has been reported that this species has caused seabird deaths on the Pacific coast of the USA (Monterrey, California, and Oregon) at densities of 4 × 105cells L-1 (Jessup et al., 2009; Du et al., 2011). The mortality is not due to a toxin but to a mechanism of saponification, produced by yellowish green foam that acts as a surfactant, stripping the oils from seabird feathers and causing death from hypothermia (Jessup et al., 2009). Several blooms of Margalefidinium polykrikoides were found in Acapulco with maximum densities of 28.1 × 106cells L-1 and 82% relative abundance. This species is characterized as ichthyotoxic with negative effects on fish from 2.7 × 106cells L-1 (Whyte et al., 2001). 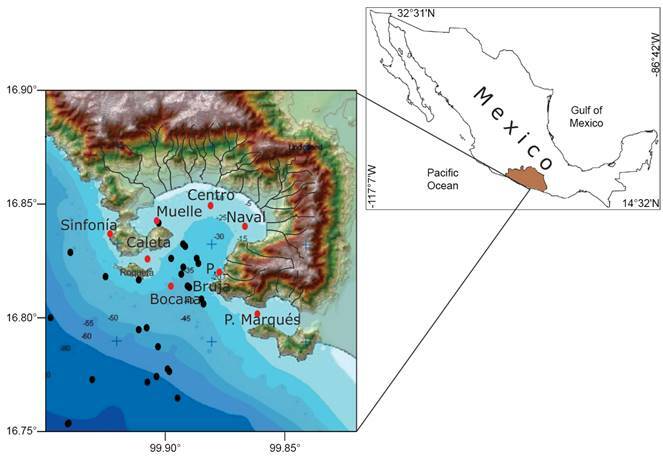 Massive fish mortalities have already been reported at sites along the Mexican Pacific: in Bahía de La Paz with densities of 7 × 106cells L-1 (Gárate-Lizárraga et al., 2004) and in Bahía de Banderas with densities of 10.8 × 106cells L-1(Cortés-Lara et al., 2004). However, in Acapulco there has been no mortality of fish related to these blooms, probably because there are no feed cages for fish. There are reports that Margalefidinium polykrikoides presents multiple ecophysiological attributes that allow it to develop in a variety of environmental conditions (e.g., eurythermal and euryhaline, withstand surface water photoinhibition, a mixotrophic diet combining phagotrophy and osmotrophy, and ability to use different sources of nitrogen) (Lee et al., 2001; Park et al., 2001; Kudela and Glober, 2012). Additionally, the species has multiple mechanisms that damage organisms of the aquatic community and different toxic agents (neurotoxic, hemolytic, hemagglutinationand zinc-bound PSP) (Onoue and Nozawa, 1989a, b), that also produces superoxide anions (O2 -*), hydrogen peroxide (H2O2) that caused lipid peroxidation that kill fish, and secreted cytotoxic agents and mucus substances (polysaccharides) that cause fish to die (Kim et al., 2001). Toxins of Margalefidinium can target a broad range of organisms and tissue types. The most vulnerable are the smallest individuals and larvae of fish, shellfish, and plankton. The Margalefidinium HAB can last for long periods because it reduces grazing; their toxins cause the decrease of predators by producing the death of filtering bivalves and planctophagous fish. In addition, they have allelopathic effects that causes the decrease of several competing phytoplanktonic species facilitating the initiation of blooms (Kudela and Gobler, 2012). In the case of the Dinophysis caudata bloom, there was no positive relationship between the density and relative abundance (RA). Hence, in the samples where D. caudata was present, it only reached less than 2% of RA (Table 4); however, it appears on the list of species that formed blooms in Acapulco, due to its cellular densities (4.2 × 103-11.1 × 103cells L-1), which exceeded the density of 1.8 × 102-1 × 103cells L-1, indicated by Reguera (2002) and Reguera et al. (2014), to consider a HAB of Dinophysis spp. Although the density values of Lingulodinium polyedra measured in the bloom of March 2014 may seem low, the species was considered as a HAB, based on the criterion set out by Paz et al. (2008) who consider that this species produces HAB when its densities are greater than 1 × 103cells L-1. Although Pyrodinium bahamense var. compressum is not the most frequent species within toxic dinoflagellate species, due to the levels of toxicity that are produced in mollusks, is the most important species in terms of HABs in Acapulco, and fortunately it is sporadic. In the last 25 years (1989-2015), it has produced five HABs in the southern region of Mexican Pacific (MP) of which only three had an impact in Acapulco (Table 6), with maximum densities of 1.4 × 106cells L-1and maximum concentrations of saxitoxins of 7309 μgSTXeq 100g-1 shellfish. Seventy six percent of the 17 HAB reported in Acapulco during 2000-2015 of the toxic species Pyrodinium bahamense var. compressum and Gymnodinium catenatum occurred in La Niña conditions, according to the graph of temperature anomalies using the MEI values (Table 4). The Olmstead-Tukey Corner Test of Association showed that the relation of the occurrence of the HAB with La Niña was significant for both species when the water temperature of the surface decreases. In the case of Pyrodinium bahamense var. compressum, these results seem to contradict those of Maclean (1989) who points out a relation of the occurrence of HAB in the western Pacific with El Niño conditions. Without exception, all dates on which the species produced HAB in the Mexican Pacific have coincided with La Niña conditions. This was confirmed by the palynological study of Sánchez-Cabeza et al. (2012) that included a long-time series (from 1938 to 2010) and found a positive correlation between the decrease in the water surface temperature and the flow of sedimented cysts. Another interesting aspect found by the same authors is that HAB development of Pyrodinium bahamense var. compressum correlates with rainfall conditions that exceed a monthly average of 400 mm. The monthly average recorded in the rainy season of 2010 when an important HAB of Pyrodinium bahamense var. compressum occurred in Acapulco was exceeded, reaching about 500 mm in August (Meave-del Castillo et al., 2012). According to Usup et al. (2012), Pyrodinium bahamense var. compressum is not a good competitor for resources and in order to grow requires terrigenous supplements such as selenium that is introduced to the marine system by temporary drainage during rainfalls. This fact, together with the qualities of Pyrodinium bahamense var. compressum, i.e., eurythermal (20-36 °C) and euryhaline (24.7-38.5), probably allowed the development of the HAB in the bay (Usup et al., 2012). Another factor that could favor this HAB is the predominant nitrogen source, given that Pyrodinium bahamense var. compressum prefers the nitrate and has a low ammonium tolerance, and the oxygen conditions in Acapulco ( 𝑥 =5.96 mg L-1) favor the predominance of oxidized forms of nitrogen (NO2+NO3). HAB of Pyrodinium bahamense var. compressum match with the observations of other authors who have evaluated HABs of this species through their sedimented cysts (Flores-Trujillo et al., 2009). 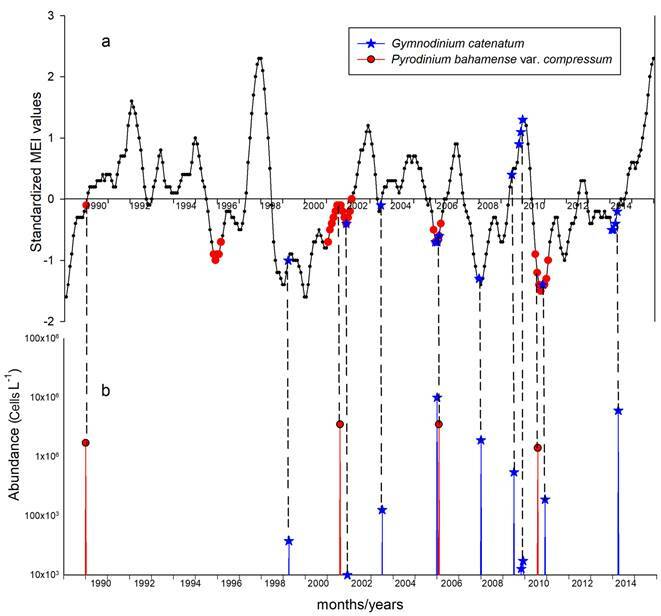 The first Gymnodinium catenatum HAB reported for the Mexican Pacific (MP) occurred on the Gulf of California in April 1979 (Mee et al., 1986), also during La Niña conditions. Additionally, some observations indicate that a negative rate of temperature change favors the bloom of this species in Acapulco (Meave del Castillo and Zamudio-Resendiz, 2014). In July 2010, Gymnodinium catenatum appeared along with P. bahamense var. compressum but in low concentrations (1.7 × 103cells L-1); later, in November, G. catenatum increased, reaching concentrations of 38.3 × 103cells L-1. Hallegraeff et al. (2012) indicate that G. catenatum prefers ammonium as a source of nitrogen. Generally in Acapulco, the forms of nitrogen oxidized with respect to ammonium predominate; however, at the end of the year and the start of the following year (during the dry-cold season), ammonium increases and reaches maximum values of 33.42 µM, since the average annual value in the bay is 2.44 µM. A relationship of increased toxicity has been found when G. catenatum consumes ammonium as a nitrogen source (Flynn et al., 1996), so a G. catenatum HAB that occurs in Acapulco from October to January may be more harmful due to an increase in its toxicity, as shown in Table 6. Since Acapulco Bay is located in a tropical zone, changes in water temperature due to the ENSO do not vary drastically compared to “normal” years. For this reason, we assume that the HABs that occur in Acapulco in El Niño conditions are more influenced by the greater precipitation that comes under these conditions than merely by higher temperatures. This factor should be considered with the fact that torrential rains influence the nutrient concentration of the water column due to the terrigenous elements carried by the run-off from the mountains to the bay. Surely this is the reason why certain diatoms (Table 3) (Hemiaulus hauckii, Leptocylindrus danicus, Pseudo-nitzschia seriata, and other dinoflagellates (Table 4) (Akashiwo sanguinea, Margalefidinium polykrikoides, Prorocentrum gracile, P. koreanum, Scrippsiella acuminata, and Tripos balechii, which bloom under El Niño conditions, were present only during the rainy season. This demonstrates that in tropical marine oligo-mesotrophic areas such as Acapulco Bay, where several species compete for resources, harmful species may find a window of opportunity to bloom at any time; however, this may be masked because the high species richness decreases the abundance (absolute and relative) of the noxious species. Table 7 shows 52 potential HAB-forming species, of which the most important to monitor are Alexandrium and Pseudo-nitzschia, since the low values of phosphorus and the availability of inorganic nitrogen compounds in Acapulco would favor such species. Some reports indicate that deficiencies in inorganic P and increased availability of organic N enhance the toxicity in Alexandrium (Matsuda et al., 1996). Moreover the decrease of phosphorus and silica increase the content of domoic acid in Pseudo-nitzschia (Anderson et al., 2009). Given that the density values of the bloom-forming species in Acapulco, reported by Gárate-Lizárraga et al. (2016), are much higher than those found on similar dates by the authors of this study, by even a one, two or three order of magnitude, we consider that it is important to perform an intercalibration of methods to discard possible errors. Both authors realized the collections and identification of algae. MEZR quantified the samples by Utermöhl method and developed the photographic plates and tables. MEMC drafted the manuscript. Both authors contributed to the discussion, review and approval of the final manuscript. We wish to thank the Laboratory of Coastal Ecosystems of the Universidad Autónoma Metropolitana, Unidad Iztapalapa, especially Francisco Varona, and Erick Ponce Manjarrez for assistance in the evaluation of water nutrients and phytoplankton biomass from Acapulco Bay. To Manuel A. Castillo Rivera for advicing on statistical analysis, José Sepúlveda Sánchez, for providing guidance during SEM manipulation. We thank Karen Steidinger for reviewing the paper. We also sincerely thank Saúl López Silva and Elizabeth Godoy Galeana, ex-Director and Director of the Laboratorio Estatal de Salud Pública del Estado de Guerrero (LESP-GRO. ), and Celso Barrila Álvarez, Director of the Facultad de Ecología Marina de la Universidad Autónoma del Estado de Guerrero, for the loan of motor boats to carry out the sampling during the study. The Comisión Nacional para el Conocimiento y Uso de la Biodiversidad (CONABIO) granted the financial support to develop the project “Diversity and dynamics of marine phytoplankton in Acapulco Bay, Guerrero” (HJ014).